Mother Nature refuses to be ignored by those who vie for power. As it KO's the US, we need to demand it be dealt with as an issue. Romney not only has taken the lead by denying climate change and berating the President for even hinting at the issue. His answer? More coal and less government regulation! He has also recently spoken out against federal disaster relief. Can you hear that in New York, Ohio and Pennsylvania? Obama, as usual, remains silent except to brag that oil drilling has increased under his administration and to talk up "clean coal" and shale oil. Arriving atop fantastically warm water and aided by a full foot of sea-level rise during the last century, Hurricane Sandy is just the latest example of climate change’s impact on human society. Unless we rapidly phase out our use of fossil fuels, most Americans within shouting distance of an ocean will—in coming years—live behind the sort of massive levees and floodgates that mark Louisiana today. The New York Academy Sciences has already begun examining the viability of three massive floodgates near the mouth of New York Harbor, not unlike the Thames River floodgate that protects London today. Another floodgate has been proposed for the Potomac River just south of Washington, fending against tsunami-like surge tides from future mega storms. Plus there will be levees—everywhere. Imagine the National Mall, Reagan National Airport and the Virginia suburbs—all well below sea level—at the mercy of “trust-us-they’ll-hold” levees maintained by the Army Corps of Engineers. Oceans worldwide are projected to rise as much as three more feet this century—much higher if the Greenland ice sheet melts away. Intense storms are already becoming much more common. These two factors together will in essence export the plight of New Orleans, bringing the Big Easy “bowl” effect here to New York City and Washington, as well as to Charleston, Miami, New York and other coastal cities. Assuming we want to keep living in these cities, we’ll have to build dikes and learn to exist beneath the surface of surrounding tidal bays, rivers and open seas—just like New Orleans. Meanwhile, it’s not our imagination that hurricanes have grown more ferocious than in the past. 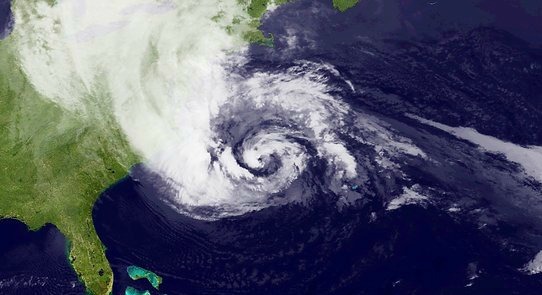 Multiple scientific studies in the past few years have found that rising sea-surface temperatures linked to global warming are causing an increase in the number of stronger hurricanes. Sandy, right now, is approaching the East Coast atop Atlantic sea-surface temperatures a full five degrees Fahrenheit above normal. One study by the Massachusetts Institute of Technology concluded that hurricane wind speeds have doubled in the past thirty years. This may account for the fact that among the six most powerful hurricanes recorded in the Atlantic Basin—going back 150 years—three occurred over fifty-two days in 2005: Katrina, Rita and Wilma. And Sandy, as measured by its area of influence, is now the biggest storm ever recorded in the Atlantic. Higher sea levels create other conditions that will only enhance hurricanes. In 1985, Hurricane Gloria made landfall north of New York Harbor. As a Category 2 storm, it could have had a serious surge tide. But it was a relative dud, causing only minor flooding. New York got lucky because the storm struck at maximum low tide. But with three feet of sea-level rise, we will be creating what amounts to permanent high-tide conditions in the New York region and everywhere else, guaranteeing that future storms like Sandy will become surge-tide heavyweights. What can we do? Three major options: (1) abandon our coastal cities and retreat inland, (2) stay put and try to adapt to the menacing new conditions or (3) stop burning planet-warming fossil fuels as fast as possible. Retreat, of course, is no one’s first choice. But adapting means committing fully to the New Orleans model. It means potentially thousands of miles of levees and floodwalls across much of the East Coast. And that’s just to handle the rising sea. For hurricane surge tides, the only solution might be to build those major floodgates across New York Harbor, the Potomac Rivers and elsewhere. But are we truly ready to become New Orleanians, casting our lot behind ever-higher, unsustainable walls? Once we commit to fortified levees and massive floodgates, there’s no turning back. It’s an all-or-nothing proposition, as New Orleans has graphically demonstrated. In truth, we must combine some level of adaptation with the third option: switching away from fossil fuels and onto clean energy. Clean energy is less expensive, less risky and overall much better for us. It’s the option that treats the disease of global warming, not just the symptoms. Only by dramatically reducing greenhouse gas pollution—by putting a price on carbon fuels and ushering in real gains in wind and solar power and efficiency—can we slow the sea-level rise and potentially calm the growth in hurricane intensity. Perhaps now, after seeing the full wrath of Sandy, the next president will move from total silence to real action. The real issue is of course, corporate rule. Neither official candidate will challenge the interests of those who fund their campaigns. It is up to us. We have never faced as big a challenge or as vital a struggle. The future of humanity hangs in the balance. An article in my local paper last July caught my attention. It was about the building of an extension at the Chesapeake Jail which was done without proper permits. Several articles focusing on that followed but the real issue shouldn't have been the permitting error. The bigger issue is that the Chesapeake Jail, built to house 543 inmates is now averaging 1,150. Chesapeake is not alone in having to deal with this problem. Virginia Beach expanded its jail several years ago and remains overcrowded as do all city jails and prisons in our region. An Urban Institute report states, “Virginia’s incarceration and reentry trends are similar to those observed at the national level. Between 1980 and 2003, the Virginia prison population more than quadrupled, increasing from 8,521 to 35,429 people. The per capita rate of imprisonment in Virginia rose from 159 to 471 per 100,000 residents in the state between 1980 and 2002, an increase of almost 200 percent.” As the report indicates, this is part of a national trend. Today the United States has approximately 1.8 million people behind bars: about 100,000 in federal custody, 1.1 million in state custody, and 600,000 in local jails. Prisons hold inmates convicted of federal or state crimes; jails hold people awaiting trial or serving short sentences. The United States now imprisons more people than any other country in the world, even more than China, a much larger and more populous nation not known for civil liberties. Our national prison population remained relatively stable throughout most of the last century. In the mid-1970s the rate began to climb, doubling in the 1980s and then again in the 1990s. The rate is now 445 per 100,000; among adult men it is about 1,100 per 100,000. During the past two decades roughly a thousand new prisons and jails have been built in the United States. Nevertheless, America's prisons are more overcrowded now than when the building spree began, and the inmate population continues to increase by 50,000 to 80,000 people a year. I have to wonder why this is. Have we become a nation of criminals? What Gives? In looking at this issue I've found some troubling trends. Most of the people locked away in our penal institutions are not violent criminals. Most are poor. The majority are are black and brown, in fact, our population of black and brown prisoners alone is greater than the entire prison population of China. About 70% are illiterate and roughly 200,000 suffer from mental illness. More troubling is the growing industry of private prisons and peripheral industries that profit from high inmate populations. Much money is made by the building and contracting of private prisons and the many peripheral industries feed at that trough, from builders and those that supply guards to food service and telephone companies that grossly overprice inmate telephone services. As bad as abuses are in state prisons like Virginia's Red Onion Supermax, plagued by scandals of abuse, torture and overuse of solitary confinement, private prisons are even worse for lack of oversight and cost cutting for profits. How did we get here? Tough on crime legislation which makes better political sense than it does policy is partly to blame. The recently exposed American Legislative Exchange Council, or ALEC, a consortium of business interests that influence legislation, plays a major role. ALEC helped pioneer some of the toughest sentencing laws on the books today, like mandatory minimums for non-violent drug offenders, “three strikes” laws, tougher immigration policy and “truth in sentencing” laws. The use of cheap prison labor for industry used to be illegal in the US to avoid unfair competition but ALEC changed that with its “Prison Industries Act,” and a little-known federal program known as PIE or the Prison Industries Enhancement Certification which, under the guise of vocational rehabilitation, allows the use of prison labor to contracting corporations like Prison Rehabilitative Industries and Diversified Enterprises, Inc. that make products from office furniture to eyeglass frames and clothes to missile parts, paying captive inmate workers only 14 cents an hour. Hard to compete with that on the open market! Vocational rehabilitation or, job training, is a good thing but it already existed in the prison system without the use of inmates as cheap labor. My stepson learned welding and plumbing in prison and has benefited as a hard-working taxpaying plumber ever since. Publicly funded skills training is a good and much needed investment but one shouldn't have to go to prison to get it and one shouldn't have to compete with prison labor to use it. Free labor cannot compete with slave labor. The Prison Industrial system that has developed over the last few decades results from and is fed by the “War on Drugs” which keeps our prison population up. This failed policy disproportionately affects African Americans. Over the past 40 years, the War on Drugs has cost more than $1 trillion and accounted for more than 45 million arrests. Since 1994, the disparity between white and non-white prisoners as a percentage of the total prison population has widened dramatically. Although whites account for 69% of drug offenses, state prison incarceration rates for African Americans for drug law violations are almost 20 times those of whites and more than double those of Hispanics. From 1990 to 1994, incarceration for drug offenses accounted for 60% of the increase in the black population in state prisons and 91% of the increase in Federal prisons. In 2009 nearly 1.7 million people were arrested in the U.S. for nonviolent drug charges – more than half of those arrests were for marijuana possession alone. Though many people in law enforcement are opposed to the continuing war on drugs, police departments have a financial incentive to continue it. When someone is found guilty of selling drugs in any quantity, police departments are authorized to seize and auction off all their property, keeping the money made. Though police departments can always use the money, it sets up a conflict of interest that encourages abuse. The cost of this failed policy has been devastating to those serving years of their lives in our penitentiaries for even minor drug infractions as well as to their families and to our communities. As we saw in the Ryan Frederick case in Chesapeake, unreliable snitches are often used to justify raids and prosecute offenses and lives are needlessly lost. Many innocent people have been locked away for years on the flimsiest of evidence. Many otherwise law abiding people using marijuana for medical reasons are criminalized as well. As Marc Mauer, the author of the book The Race to Incarcerate says, "We have embarked on a great social experiment . . . No other society in human history has ever imprisoned so many of its own citizens for the purpose of crime control." It seems we are becoming a prison nation. I note that many of our most loudly patriotic citizens are often the most vociferous in voicing tough on crime attitudes, ready to condemn and lock others away – often using the term “thug” with racist overtones. It has become part of our mindset and culture. I have to wonder, is this nation we want to be? What are the alternatives? How can we turn this around? It seems to me that the privatization of prisons and the incentive of property seizures and slave-cheap prison labor must end. The failed and costly mass criminalization resulting from bad immigration policy and the war on drugs must end. Nobody wants dangerous criminals running free but is imprisonment really the best and only consequence for non-violent offenders? Historically, jail is where the condemned awaited punishment, whether hanging or lashing or the public degradation of the stocks. I don't know that we want to return to public lashings though I would prefer a painful beating to a decade in prison. Public lashings were banned in the early 19th century as cruel and unusual but is seems to me that taking years of someones life is far crueler and often worse than the offense being punished. The only people we should lock away are those violent criminals who otherwise would be a danger to others. I think that for many minor and non-violent infractions, fines, public service of some kind, public degradation, home monitoring and sentences served on weekends are better alternatives. Efforts to standardize sentencing guidelines, though well intentioned, have limited judicial discretion and can prove an obstacle to real reform. That this is the kind of subject opportunist politicians avoid fearing the repercussions of being labeled “soft on crime” reflects another problem in itself. Given the growing number of us behind bars and the incentive to capitalize off incarceration in an otherwise tough economy, this is something we need to talk about and reconsider. I believe the time is now. Great article in the new New Yorker Magazine called, Super-Rich Irony describing the organization of ungrateful hedgefunders supporting Mitt Romney, Interestingly noted is that, economists Emmanuel Saez and Thomas Piketty have found that 93% of the economic gains from Obama's policies over the last year went, not surprisingly to 1% of the wealthiest. Of that, the even richer 0.1% got 37% of it. The rest of us of course got dunned by our creditors, threatened by our bosses, (those that still have bosses), had our job applications ignored, got spied on by Homeland Security and were fed a lot of lies by the bourgeois press. In short, we've been screwed and these parasitic slugs, feel slighted if not threatened by Obama. Most of the article focuses on Leon Cooperman, CEO of Omega Advisors and third richest man in the US who formed SkyBridge Alternatives, a group of aggrieved billionaires who feel victimized and unloved by the ungrateful unwashed. Note in the article that Al Gore was the guest of honor at their fourth,(what a coincidence) annual convention. National Defense Authorization Act under which you or I can be imprisoned indefinitely without charge and likely tortured, but the building of an intrusive domestic spying system continues with the largest government project since the moon landing. I can think of government projects we need like a new power grid or a new national rail system but instead they are using our taxes and resources to build a giant NSA spy center capable of monitoring every communication and transaction of every one of us. Below is an interview with William Binney, a 32-year veteran of the National Security Agency who helped design a top-secret program he says is broadly collecting Americans’ personal data. This needs to be exposed and stopped but in the present, we need to be aware of it and not take the privacy of cellphone communications or plastic transactions or internet postings for granted. In fact, we should use more cash, communicate more directly and use our own coded language for activism. The grid has been hacked, time to get off of it as much as possible. Other subjects left out of the debates include the most important one of all. While Obama didn't even call Romney on his "I love coal" statement, we are facing the greatest crisis in human history as the environment collapses but both candidates are too beholden to the energy industry to really say or do what is necessary. Romney is especially tied to big oil via the Koch Brothers and is pushing for evisceration of weak EPA standards along with the XL pipeline. Neither candidate will be asked about their support of the Drone terrorism and neither will acknowledge that the US economic crisis is part of a much larger crisis of the global failure of capitalism. Neither will really get into the economic disparity that has resulted which is why Obama didn't bring up Romney's "47%" comment. Sadly, while Obama is the better of the two, neither will address the greatest issues facing us or do what is necessary to prevent the collapse of civilization or the ecosystem on which our survival depends. Corporatist politics is inadequate, it is a game of by and for the 1%. Moving beyond it is up to us. As Arundhati Roy said, "Our strategy should be not only to confront empire, but to lay siege to it. To deprive it of oxygen. To shame it. To mock it. With our art, our music, our literature, our stubbornness, our joy, our brilliance, our sheer relentlessness, and our ability to tell our own stories…" We are the 99%.